Astrology, the Divine Science, the Mother of all sciences, the source of all languages, the peak of all knowledge, the tower of understanding that reaches to the Heavens, is “The Tower of Babel”. A contemporary decadent example would be the many different existential branches of Astrology, each in bitter discordant argument with the other, each trying to reach the top separately at the expense of the other.’. This article, it is hoped, will shed some light on an aspect of the Celestial language that has been the source of much confusion, ignorance and babel. Yes, in Astrology there are three Zodiacs; each measuring the same reality differently. 1. Like English, Hindi, and Chinese, they are each exclusively different, and yes in each we can count to twelve. 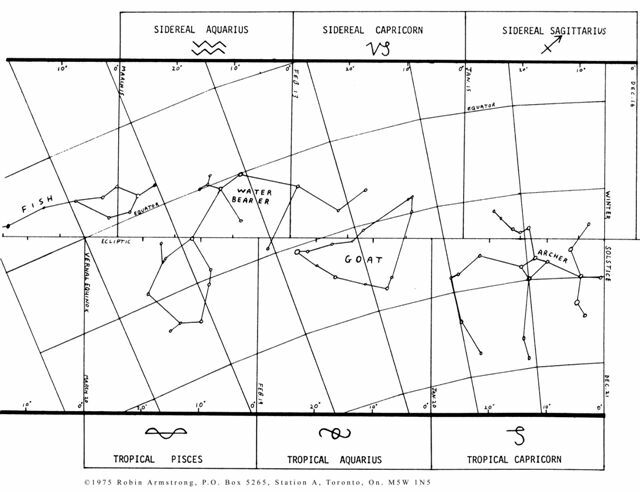 In Astrology we have the Tropical Zodiac; the Sidereal Zodiac, and the Zodiac: of Constellations. Each of these Zodiacs ‘have the same constituting 12 names, but the .same name measures a different area of space and/or time. For example: when on March 20 the Sun enters the 1st degree of the Tropical Zodiac Sign of Aries, it is also(in the 6th degree of the Sidereal Sign of Pisces, while at the same time it has reached the 13th degree, (day) into the Constellation of Pisces. It is not my intention to diminish any of the three Zodiacs, but rather to provide graphic explanations of this seemingly confusing state of affairs so that translation of knowledge from one system into the other becomes possible. In this manner comparison can be made individually as to which system, if any, is best. Hopefully ‘this article may also enable Astrologers of different Zodiacs to relate and communicate constructively with one another. This article is further designed to stimulate knowledgeable controversy and research. The Tropical Zodiac is basically a Zodiac of time. It divides the year into four seasons: Spring, Summer, Autumn, and Winter, and further subdivides each season into 3 equal phases. Thus we have the 12 Signs of the Tropical Zodiac each consisting of 30 degrees. This is the most common or popular Zodiac in use today. It relates each sign to a season of the year. The idea being that persons take on character traits and qualities similar to those of the season of the year in which they are born. For example, there are persons with warm summer type natures and others with cold wintry natures. 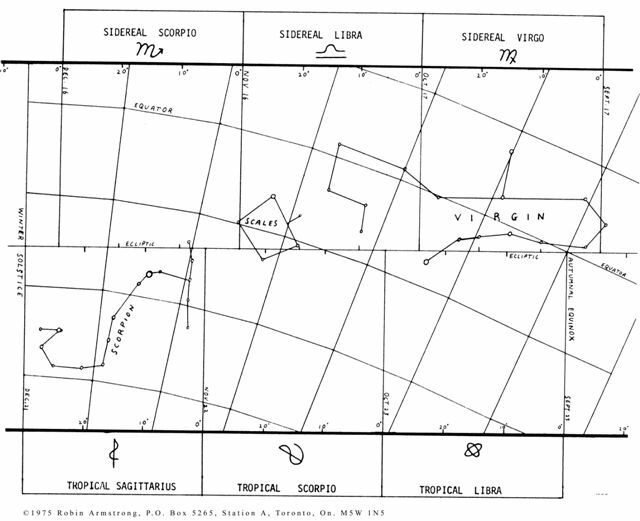 In depth the Tropical Zodiac measures the changing ratio of day to night throughout the year or through each orbit of Earth around the Sun. For half of the year, the amount of daylight is increasing. For the other half of the year the amount of night time or darkness is increasing. Half of the year day is longer than the nights. The other half of the year, the nights are longer than the days. This changing ratio of day to night throughout the year established the four seasons and the four most recognizable moments (The Spring Equinox, the Summer Solstice, the Autumnal Equinox, and the Winter Solstice) of the year. This is truly the pulse of Life, the rhythm of Nature, a rhythm which we all obey. When it is hot (in the Summer) our behavior is distinctively different from when it is cold in the winter. The impulse of Spring strikingly differs from the impulse of Autumn. 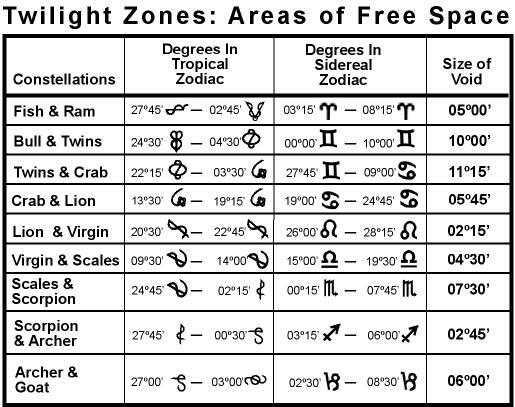 The Tropical Zodiac explains that when day is longer than night, the individual aspect of life is stressed (the “I”, or “ME”). When night is longer than day, the collective, communal, or group aspect of life is accentuated (the “WE”, or “US”). With individuality comes independence and freedom. With collectivity comes interdependence and responsibility. Think about it! It’s an observation of a fact of life, that when daylight increases so does our sense of individuality and desire for independence — consider the fires or passions of Spring. When darkness increases so does our communal or social participation – witness the increase of social activity in the Fall. The Tropical Signs of the Zodiac measure and gauge the behavioral patterns of man in reaction to the seasonal changes of life. These are expressed in terms of basic tendencies and modes of action. This association has nothing to do with the more mysterious attribution of animals to the Zodiac, but instead the Tropical Zodiac is a psychological assessment of life patterns and tendencies. The Tropical Signs are divisions of time. They are 12 phases in a symphony and like a symphony they manifest tone or colouring. This is assessed qualitatively rather than quantitatively. 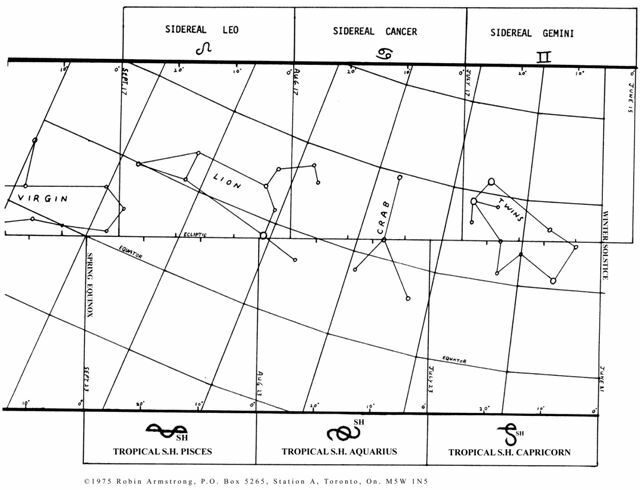 The Tropical Zodiac contains 360 degrees, or in other words measures 360 phases of a cycle of time (1 year). Using this Zodiacal gauge of 360º the planets are put in their respective places and a horoscope is drawn up and completed. Up to this point, the Tropical Zodiac, its applications and interpretations are exceptionally valid. The system is sound and workable. One need never go beyond this point however, some have. As the need or desire arises to expand on the foundation and relate the stars in the sky to the horoscope, a subtle problem arises. The planets and their inter-relations in a horoscope reveal the habit pattern of a person. They reveal the way energy from the Sun (Source of Life) will be used. As many lives are studied some people seem to lead exceptionally unique lives or manifest very special energies which may not be explained in the Tropical Zodiac. Some people seem to live fated or destined lives, lives far from the normal rhythm of Nature. It seems as if some people are tuned in to higher frequency energy sources. 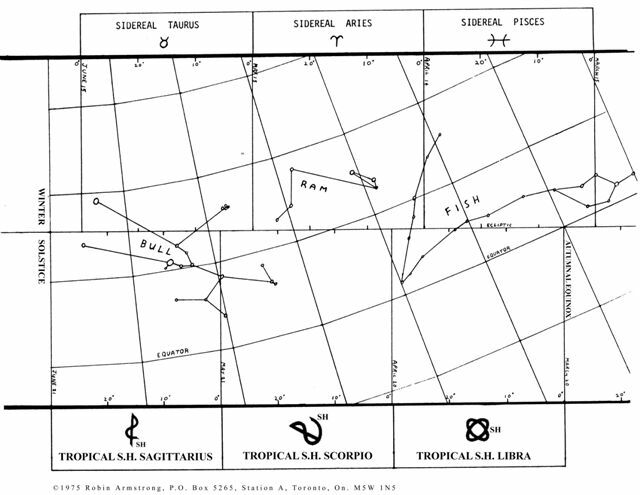 The Tropical Zodiac accounts for the use and nature of energy from the Sun and distributed by the planets. However if one were to consider the energy coming from other Suns, or stars as they are called, one might gain new insights. This energy should not be overlooked as it contributes about one tenth of the light energy reaching this planet Earth. The subtle problem with the Tropical Zodiac when referring to stellar positions is that it moves. It is like a small fast moving wheel within a larger stationary or slow moving wheel. The stars are more or less fixed in their positions in the space of the Heavens. Their movement relative to each other is negligible from our vantage point. However, a star at 24º00 of Libra in 1972, would be at 23º00 of Libra in 1904. In 1261 A.D. the same star would be at 14º00 of Libra. In 221 A.D., the same star would be at 29º00 of Virgo. This movement is known as the Precession of the Equinoxes. The Sidereal Zodiac is a measure of Space. It divides the Heavens into 360 degrees or 12 signs of 30º each. 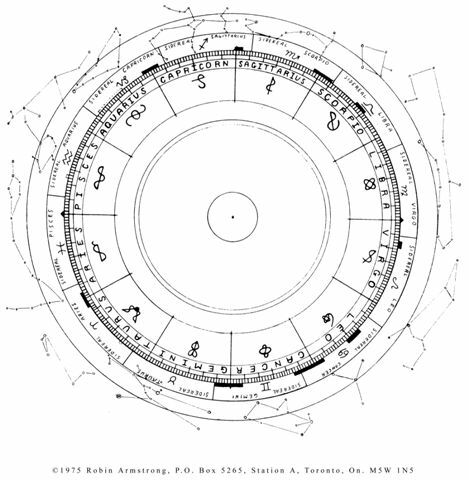 On this spatial gauge the positions of the planets, Sun, and Moon are placed in reference to the position of the stars. In the Sidereal Zodiac the stars remain in fixed positions. They stay in their place and do not move through the degrees. The Sidereal Zodiac is therefore constant, as the stars when viewed from Earth move only about one degree in 120,000 years. In the Sidereal Zodiac we are not interpreting the seasonal influences but instead the stellar energies. The 12 Sidereal Signs could be referred to a Star Signs rather than the Tropical Sun Signs. The Sidereal Astrologer could readily be called Star-Gazer, as a most complimentary expression. The 12 Sidereal Star Signs have the same names as the Tropical Sun Signs but they do not at present coincide. 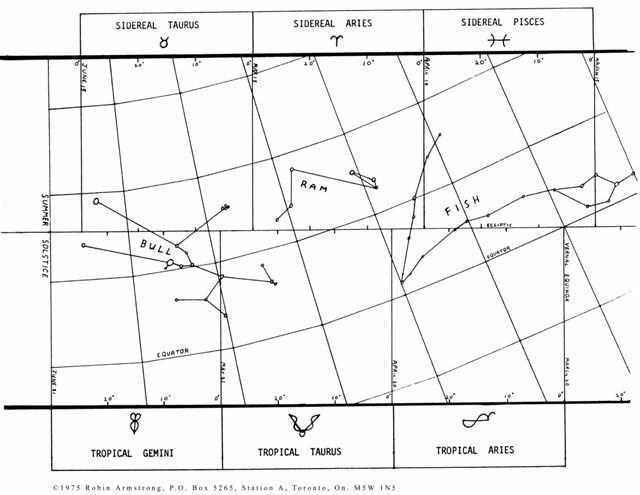 The Tropical Zodiac moves backwards or retrogrades through the degrees of the Sidereal Zodiac. This movement occurs at the rate of approximately 1 degree in 71½ years, or more exactly 50.26 seconds per year. In the year 221 A.D., the two Zodiacs coincided exactly. This was the beginning of the Piscean Age (Sidereally). Considered at the present time of March 21,1976, the Vernal Equinox or beginning of Tropical Aries occurs at 5º35’18.0″ of Sidereal Pisces. The difference between the two Zodiacs is called the “AYANAMSHA” (a Hindu term) and on March 21, 1976 the Ayanamsha is 24º24’42”. To find the Sidereal positions of a planet on March 21, 1976, simply subtract 24º24’42” from its longitude in the Tropical Zodiac. In the year 2376.5 A.D. when the Ayanamsha will be 30º0O’OO” and the Vernal Equinox will enter the Sidereal Star Sign of Aquarius, the Age of Aquarius will begin. There has been considerable discussion and difference as to the actual beginning of the Sidereal Zodiac. At what point or perhaps what star in space marks that Great Beginning? Here I must refer you to an excellent book on the subject by Cyril Fagan, entitled “Astrological Origins”. I am in agreement, at the present time, with Cyril Fagan and with R.O.S.A. (Registry of Sidereal Astrologers) as to the alignment of the Sidereal Zodiac. This alignment places Aldebaran at 15º Sidereal Taurus, Regulus at 5º Sidereal Leo, Spica at 29º Sidereal Virgo, and Antares at 15º Sidereal Scorpio. This arrangement places the 12 Sidereal Star Signs in close proximity to the actual Constellations of the Zodiac. Since each Sidereal Sign uniformly covers a 30º section of the Heavens, it cannot exactly coincide with the constellations. It is at this point that a subtle problem emerges with the use and interpretation of the Sidereal Signs. The interpretation for each Sidereal Star Sign is based on the constellation which more or less, but not always exactly coincides with it. The most evolved and sophisticated work done with Sidereal Astrology is in India. Hindu Astrology is Sidereal Astrology. The only difficulty with the Hindu books is that there are so many different technical terms to become familiar with. Once this challenge has been met, there is much to learn. In the stellar graphs accompanying this article, it is necessary to distinguish between the three Zodiacs: the Tropical, the Sidereal, and the Zodiac of Constellations. To this end new symbols are used to express the Tropical Zodiac Sun Signs. These symbols are not unsimilar to their traditional counterparts. 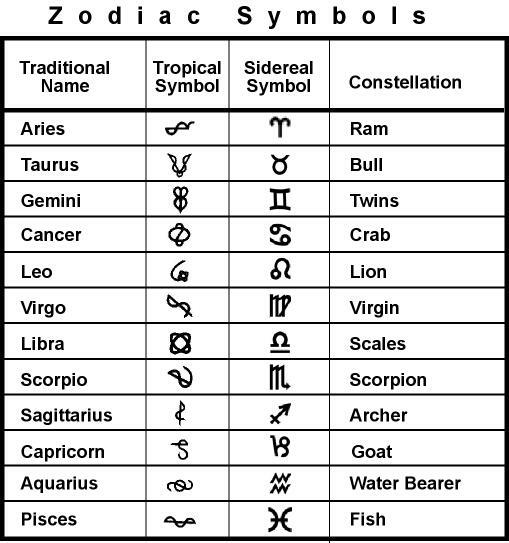 The traditional symbols for the Zodiac are used to express the Sidereal Zodiac’s Star Signs. And for the Constellations, the corresponding animal or figure’s name is used. For quick easy reference, refer to the table below. In the Zodiac of Constellations each Constellation occupies a different portion of space and a unique number of degrees of the Zodiac. Some Constellations are very small while others are very large. 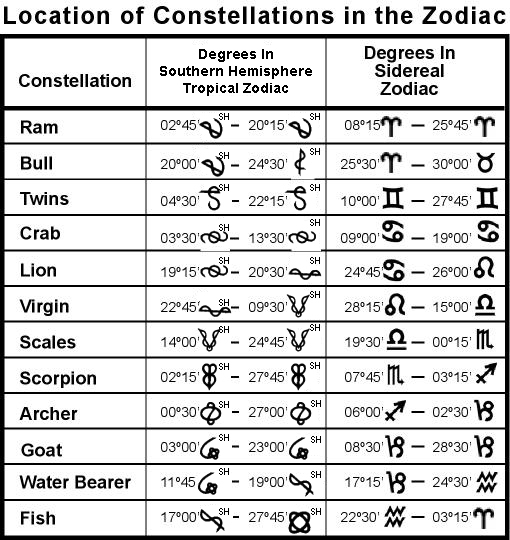 The following is a table of the Constellations and the approximate degrees which they occupy in each Zodiac. Some Constellations actually overlap one another and to some extent share or rule the same degrees. The next table shows the areas in each Zodiac that contain stars of two Zodiacal Constellations. There are large empty spaces between some Zodiacal Constellations – spaces which contain no stars of either bordering constellation. These spaces could be interpreted as “TWILIGHT ZONES” where neither Constellation holds an influence; or where there might be a choice of either; or a combination of the two. I personally favour the Twilight Zone concept where anything is possible. In a Twilight Zone there will be a VOID of Constellational influence or a need for resolving the message of both Constellations on one’s own, independent of either. To my mind, these would be very likely places for the outer planets of Uranus, Neptune, and Pluto (planets that can’t be seen with the naked eye) to have rulership over. The concept here is that the outer planets work best when free of traditional definitions and limitations. The outer planets seem to bring change from beyond. As we continue to asses the zone of a Constellation’s influence, another subtlety arises. When considering Constellations should we demand exactly and exclusively the area contained by the stars of the Constellations? Or, could we accept the area bounded by the superimposed drawing of the constellational symbol around the significant stars? This can make a considerable difference with regard to the length of the Twilight Zones and the Overlapped Degrees. In this article I have chosen the exclusive skeletal area marked by the stars. These are only approximated the orbs of the Twilight Zones in the table below. The exact orbs may be published in a future edition. How the Constellations got their names and attributes, no one knows. They have been passed down to us from generation to generation since a time before the dawning of recorded history. The Constellation of the RAM occupies approximately 18º only, and its influence is totally contained within the Sidereal Sign of Aries. The Constellation of the BULL occupies approximately 35º. The BULL’s influence completely fills the 30º section of Sidereal Taurus but also extends its energies over the last 5º of Sidereal Aries. The CRAB Constellation covers only 10º and is contained within the Sidereal Sign of Cancer. The Constellation of the LION covers about 31º and occupies the first 26º of Sidereal Leo. The LION also radiates into the last 5º of Sidereal Cancer. The Constellation of the VIRGIN occupies 47º. Not only does the VIRGIN completely influence the Sidereal Sign of Virgo, but she also radiates into the last 2º of Sidereal Leo, as well as the first 15º of Sidereal Libra. The Constellation of the SCALES fills only 11º – the last 10º of Sidereal Libra and the first degree of Sidereal Scorpio. The SCORPION Constellation covers 26º and spreads its energies over the last 23º of Sidereal Scorpio and the first 3º of Sidereal Sagittarius. THE ARCHER covers 26º and emits its energies through the last 24º of Sidereal Sagittarius and the first 2º of Sidereal Capricorn. The GOAT covers 20º and its energies are contained within the Sidereal Sign of Capricorn. The GOAT however, does not occupy this space exclusively. The WATER BEARER too has a foothold in Sidereal Capricorn. The WATER BEARER covers 38º and spreads its influence over the last 13º of Sidereal Capricorn and the first 25º of Sidereal Aquarius. The Constellation of the FISH occupies approximately 41º and also extends its influence beyond its own Sidereal 30º realm of Pisces, into the last 7º of Sidereal Aquarius, and also into the first 4º of Sidereal Aries. The Impulsive passionate tendency of the Tropical Aries is permeated by the Constellation of the FISH, thus creating for Tropical Arians deep subconscious impressions and powerful instincts. This manifests as a strong desire for action, a headstrong impulse into the future, and a deep fear of the past, of the unknown, and of unfulfilled memories. The first 20º of the stability oriented down-to-earth Taurus is permeated by the RAM, thus creating a strong desire for and forceful drive towards material rewards. There is a definite determined tendency to use ones head to accumulate valuable possessions. The last 10º of Tropical Taurus holds the Body of the BULL and here there is a powerful and stubborn resistance to change, especially if ones security is threatened. Tropical Gemini contains the BULL. Here the freedom oriented, individual (creative) expressions of Gemini are given a stubborn determination to resist restrictions and social obligations.” I HAVE to speak for myself! The impressionable, feeling oriented Tropical Cancer receives direct energy from the TWINS. This manifestation permeates the sensitive Cancerian with a kind of psychic duality, where two impressions are constantly being experienced simultaneously, leaving perhaps a kind of emotional scatterbrain or in extreme cases, an impressionable kind of schizophrenia. The CRAB reigns over the first half of Tropical Leo manifesting as a tendency to withdraw whenever self esteem seems threatened or challenged. There are many quiet introverted Leos. Here there is a strong need to be noticed and a very sensitive pride. The last 10º of Tropical Leo is influenced by the LION manifesting a very powerful sense of leader ship and a strong creative force. If anything in the kingdom is not as it should be, you’ll hear the ROAR! 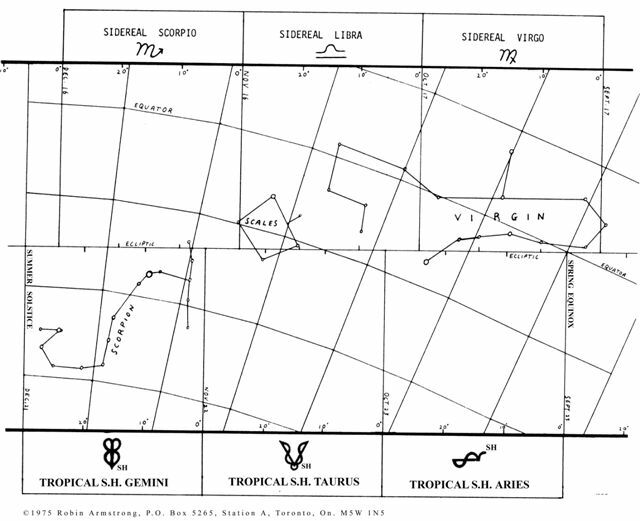 Tropical Virgo is permeated by the LION for the first 23º. Here there is an authoritative sense of knowing the best way to do something. There is a pride in a job well done and an almost arrogant manner of demanding perfection in everything. The powerful analytical abilities shine royally, so don’t criticize their performance – let them do it. The last 7º of Tropical Virgo are ruled by the VIRGIN revealing strong naivety, self analysis, self discipline, and self preparation. Here analysis and self definition is carried to its extreme limits. Tropical Libra is encompassed by the VIRGIN. Here the socially oriented, harmony seeking Libran takes on a naive search for the ideal or perfect partner and relationship. Too often he or she stays up in the clouds – preferring to live with the mental ideal or design rather than losing his purity in an imperfect reality. The passionate Tropical Scorpio receives direct radiations from the VIRGIN and the SCALES. Here ideals and visions are brought down to inescapable social reality. Naivety and virginity are put to the test of life. The results are weighed in the balance: honesty or dishonesty results. The high-minded, socially oriented Tropical Sagittarian receives the emanations of the SCORPION. Here we experience the devastating sting of truth and higher learning. If one is to elevate one’s nature, it becomes necessary to leave the lower instincts behind and below. A tactless expression of truth can too often bring pain to others. There is a need to keep one’s thoughts and opinions to oneself. The practical ambitious, Tropical Capricorn gains a one pointed arrow-like thrust toward social security, due to the ARCHER’s presence here. An ARCHER on a mountain top increases his power. Capricorns like to call the shots, and if they can secure a solid social foundation, they can certainly steady the aim of their ambition. Tropical Aquarius contains the GOAT and a portion of the WATER BEARER. The friendly eccentric Aquarian finds that the oppressive burden of unfair and unlimited responsibility gets his goat. He will only take so much limitation and injustice before he bears his cup of emotional injustice to his friends and they all rebel, – pouring themselves into the need for change and release. Here some remarkable distinctions reveal them selves. For example: there is a marked difference between each Tropical Zodiacal Sign for the Northern Hemisphere and the same named Tropical Sign for the Southern Hemisphere. It reveals itself in the form of difference in inner impulsion. In the Northern Hemisphere Tropical Aries is ruled by the FISH; in the Southern Hemisphere Tropical Aries is ruled by the VIRGIN. The Southern Hemisphere Tropical Aries, ruled by the VIRGIN is more naive than his Northern Hemisphere counterpart. There is a strong desire to work hard and an impulse to criticize – perhaps a desire for perfection – The Southern Hemisphere Aries will become nervous or critical when there is nothing to do. The N.H. Aries is instinctively active, while the S.H. Aries is more analytically active. The S.H. Taurus is more naive and exacting of her possessions. They will put their possessions on the SCALE and take the highest value. The S.H. GEMINI will find that freedom of expression can have a Scorpion’s sting, and that too much independence can hurt. The S.H. Cancer is more likely to set his aim one pointedly for personal security. He is also more likely to hit the mark. He is unlikely to be satisfied with a small house. The S.H. Leo is burdened by the GOAT of responsibility. He will be ambitious and go for the top. He wants to have the best friends. The S.H. Virgo is more inclined to listen to his friends, but would still be choosy . The latter part is much more impressionable and less self-defined than the N.H. Virgo. The S.H. Libra : there is something fishy here. The high ideals seem to come from watery depths. There is a strong instinct to relate. The S.H. Scorpio is certainly an impulsive, passionate, and powerful person. – reckless and rash in love – He is dangerously jealous with a violent temper. The latter portion of the S.H. Scorpio is much more practical and down to earth. The S.H. Sagittarius This high-minded S.H. Sagittarian is determined to have wide horizons and no fences. Endowed with a practical understanding of life, the S.H. Sagittarian is not quite as tactless as his Northern Hemisphere counterpart. The S.H. Capricorn is very likely to have TWIN visions of success, double ambitions, and perhaps a two-faced sense of responsibility and authority. The S.H. Aquarian is ruled by the CRAB (Is a CRAB?) There is a tendency to bide in a shell, perhaps timidly. The royal dignity of the LION does instill courage and pride. The later Aquarians would tend to have a greater sense of self esteem than the earlier ones. The S.H. Pisces is very sympathetic and kind however the main distinction here is that they have a LION’s heart and are more inclined to define their limits except when it comes to love. Romance doesn’t peep – it ROARS! The above Tropical considerations are potent preliminary contemplations designed to establish and awaken an inclusive conceptual technique of Zodiacal appreciation and assess An article of this size cannot do justice to the theme. Perhaps in a future article I will elaborate further and in much greater thoroughness, if sufficient interest is voiced. 1. The planets will be in the same house positions in each system. 2. The planetary aspects will also be the same in each system. Please remember that in all cases the same reality is being measured. It is the qualitative assessment that differs, that is the Zodiacal colouring. On the last page is a Northern Hemisphere horoscope blank on which all three Zodiacs are represented. Due to the chart form’s size, there is some distortion to the actual constellations, although the stars are roughly in their correct degrees. The Twilight Zones are shaded black. This chart is blank so that you can place your own horoscope in it and compare systems.